Hundred Waters‘ fourth annual FORM Arcosanti festival goes down May 12-14 at Arizona’s Arcosanti. The band curated the lineup with Moses Sumney this year, and it’s pretty cool. 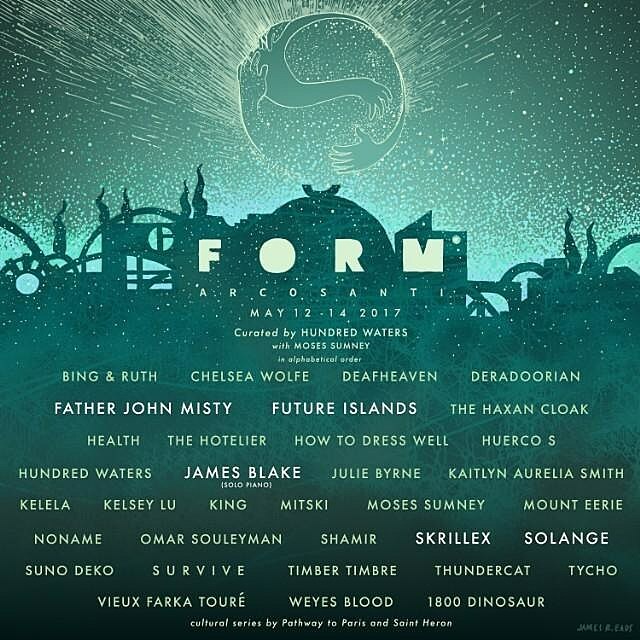 In addition to Hundred Waters and Moses Sumney, they’ve got James Blake (playing a solo piano set), Solange, Skrillex, Futue Islands, Father John Misty, Deafheaven, Chelsea Wolfe, The Hotelier, HEALTH, How to Dress Well, Julie Byrne, Kelela, KING, Mitski, Mount Eerie, Noname, Omar Souleyman, Shamir, S U R V I V E, Thundercat, Tycho, The Haxan Cloak, Bing & Ruth, Weyes Blood, and more. For a chance to get into the festival, you have to fill out this application. 1,500 people will be selected. Full lineup below.